In summary, the report details what we all have heard is coming – the baby boomer generation will all be retired soon. By 2030, it is estimated that the elderly will account for 76 percent of the entire population in America. In a nutshell, there will be more people retired and requiring governmental assistance for health care, than there will be people working and paying the taxes to foot that bill. Hurts your head to think about, right? Well, it gets worse. That same future workforce paying the taxes that won’t be able to meet the needs of the boomers will also need to be thinking about education for their children. Future tax dollars will be stretched thin (like they aren’t already) between health care for the elderly and education for the youth. Ouch. What’s the solution? Focus on students. Dr. Ladner concluded that by providing our youth with a stellar education now, it will set them up for success, providing them with the skills necessary to obtain well-paying jobs in the future. This is what will help to make health care possible for the elderly (current boomers), and education possible for the new youth (yet to be born). 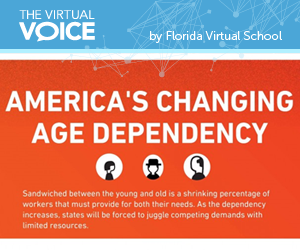 After reading the report, I started to think about how FLVS can help students get the high quality education they deserve while helping the state tackle this looming problem. Just last year, Dr. Matthew Chingos of the Brookings Institute confirmed that FLVS continues to be a cost savings for taxpayers, and that it still delivers the same or better quality of education. To check my thinking, I reached out to Dr. Ladner and asked if FLVS is part of the solution. I was pleased to hear back that we are. “Today’s students will be met with an unsure future as they will have to struggle to pay for healthcare for the elderly and education for the youth. Florida is expected to have the highest growth in people over the age of 65 in the nation – a cause for concern. We can alleviate some of these struggles by providing students with a good education today. – Dr. Matthew Ladner, Senior Advisor of Policy and Research for the Foundation for Excellence in Education. To read the full Turn and Face the Strain report here. In the mean time, let’s keep helping students today so they will be better prepared for their future, enabling them to help the rest of us tomorrow. This entry was posted in Educator Edition, Parent Edition and tagged FLVS, Government, Healthcare, Leaders, Legislation, Legislative Updates, Next Generation, Policy, Results on February 17, 2015 by Holly Sagues. How about feeding those who need it?